This detailed review of NutraBio Forskolin is presented here to enlighten potential consumers with important information about the formula, dosage instructions, price, possible side effects and if there are any guarantees. This product contains forskolin natural extract, which is widely known to promote lean body mass. NutraBio Forskolin is manufactured to high-quality standards in its registered and inspected facility, which also meets GMP regulations. Coleus Forskohlii is the plant source of forskolin. The main ingredient of this product is Coleus Forskohlii extract that is standardized to 10% forskolin. The only other ingredient used is to form the vegetable capsule, that is used for better digestion and absorption. Most importantly it does not contain any chemical additives or fillers. It is also free of any genetically modified organisms (GMOs). It is suitable for people on a gluten-free diet and is vegetarian-friendly. This product can be taken as a dietary supplement. It is recommended to take one capsule two times a day. It must be taken with meals or as directed by a doctor. A bottle that contains 60 capsules costs $21.99 (plus shipping charges) which is discounted from the retail price which is $32.99. The product is also available on other retailer sites for the same price. NutraBio Forskolin is designed in such a way to lessen the chances of an allergic reaction. However, this product is not meant for children under 18 years of age. Also, if you are pregnant or breastfeeding, you must definitely consult your doctor before using this product. People with known medical conditions and taking prescription medication should consult with a doctor prior to taking this product. NutraBio Forskolin comes risk-free as it is backed by a 100% money back guarantee. This refund policy is valid for 60 days from the date of purchase. So any item irrespective of whether it is opened or unopened can be returned to receive a refund, if you are not happy with the product. Shipping costs will not be included in the refund. You will not be eligible for a refund, if you return the item after 60 days from the date of purchase. 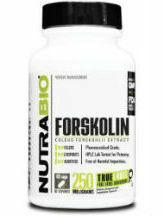 After our review of NutraBio Forskolin, we have concluded that this is a product that had some shortcomings. We did like that tThis product is made in the USA to high-quality industry standards in a cGMP certified laboratory. The manufacturer also states that the raw ingredients undergo state of the art HPLC analysis to insure zero tolerance for impurities. However this product did not work that well according to consumer feedback. We were greatly discouraged by this.